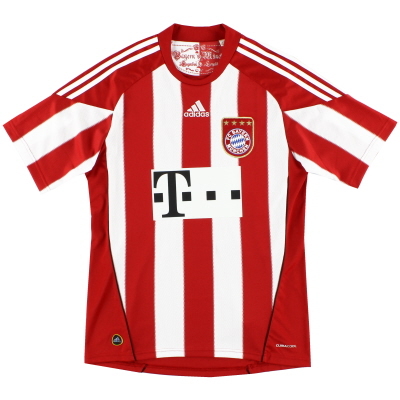 The Bayern Munich shirt sponsor from 2010 to 2011 was Deutsche Telekom. Bayern Munich of Germany's Bundesliga. Home Shirt 2010-11. Maker: Adidas. Franck Ribery Home FC Bayern jersey with Lextra Deutschermeister 2009-10 patch. Bayern's 2010-11 home kit, Arjen Robben's nameset on back. Unluckily, the front sponsor's imprint was moderately damaged. 2008-09 Bayern Munich Away Shirt Adidas Original Vintage shirt from Classic Football Shirts Ltd.